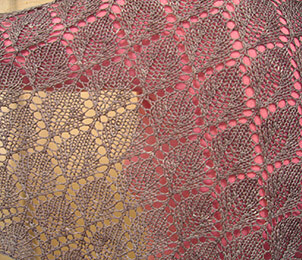 This shawl is spectacular, but I had no idea how difficult it was to take a good photograph of such a large and intricate object. The leaves, specifically the way each leaf is surrounded by a halo of yarnovers, are easy to spot and very captivating. The edging is clever, beautiful, and fits perfectly within the sea of the leaves. Size: I made the “small” size, working a total of 10 repeats in sportweight yarn, as the pattern specified. The shawl measured approximately 22.5″ deep and 48″ across before blocking (click to see a photo of me modeling the unblocked shawl). 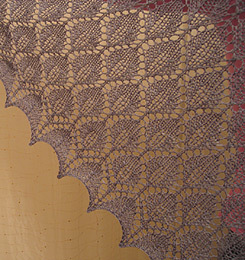 After blocking, the shawl is 29.5″ deep and 64″ across. This is my only worry – I’m afraid this shawl is much larger than what my mom had in mind, but the faux pas is entirely mine. The pattern predicted a shawl that’s even a bit bigger (33″ deep, 68″ across top) and I just didn’t realize how big that is in real life. Were I to go back, I’d work only 8 repeats, which would give me a shawl close to the unblocked size, “an oversized bandana,” as I called it earlier ;). Feeble, feeble attempts. As I told a student earlier this afternoon, “Just believe me, okay?” Hehe. I think it’s clear that I seriously admire the dyer’s ability to match my mom’s request both by suggesting and custom dyeing the perfect yarn. I would recommend her services without any reservations, and will do so as soon as she opens her business in early 2006. So, that’s that for my first shawl attempt, for my first true lace attempt. Next: I mail this to mom, and cross my fingers that my grandma asks for a shawl, too ;). Gorgeous! 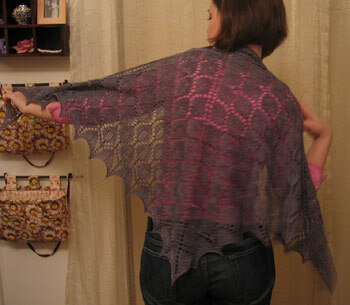 I just finished the Fibertrends Pacific NW shawl – their patterns are fabulously well-written. Now I’m working on Ene’s shawl from Scarf Style, and I never knew how fun it would be to start on the long edge and work in. Those rows just get shorter and shorter . . . It looks just beautiful . . . who could possibly complain about it’s being too big?? Beautiful!! I’m sure your mother will not complain about the size once she sees how beautiful it is. Plus, she can fold/roll the top edge down to make it smaller. I found your blog recently and am always admiring your beautiful knitting! I’m making Sharfik for my dad and plan on making a Picovoli for myself soon. The shawl is absolutely beautiful! I love everything about it. I’m sure your mom will too. How beautiful! Now that you know 8 repeats, you could keep the too big shawl for yourself and knit up another for your Mom. Just beautiful. I bet your mom loves it just the way it is – she just didn’t realize how good a larger shawl could be. BEAUTIFUL! I love it. Great job! OOPS… it should say “who” instead of “how”… it is 6.20 am and I’m not native english speaker… that’s my excuse and I’m sticking to it LOL. Wow, that really is a thing of beauty! I love it! Great job! I’m sure your mom will love it no matter the larger than requested size. so, so, so beautiful. absolutely gorgeous. your mum will be thrilled. and remember, it will scrunch up a little with wear. it’s SO great. your mom will love it. i’m so happy you had such a great first experience — the knitting, the yarn, the dyeing. it all came together so beautifully. Grumperina, the shawl is absolutely stunning. I love the steel colour! I’m sure mom will love it even if its a bit larger than you has hoped. Wonderful work, and welcome to the world of lace knitting. Isn’t it nice when projects turn out exactly as you plan? I’ve always been happy with HA yarn – glad it met your expectations, too. your mom is going to love it. beautiful work! simply beautiful. Very nice jump into the lace pond. I’m sure we’ll be seeing more. You are a wonderful daughter. That is simply beautiful! So beautiful! Wow, I can’t wait for that dyer to open up shop. Your grandma will ask for one once she sees this one! You should send her a pic of it to whet her appetite. Everything came together perfectly, it’s gorgeous. 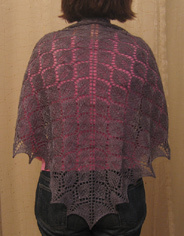 I think this size will be a little more comfortable for your mom to wear than a smaller shawl. It’s stunning! What a lovely gift for your mother. absolutlely gorgeous. It is hard to photograph…but I see the beauty! I cannot believe how quickly you knit that up, even in sportweight! Wow. And it is just beautiful. I agree with everyone else that your mother will be fine with a larger shawl. My dear, that is not a lace knitting attempt! That is lace knitting mastery! It’s just lovely. What is there to say? It’s beautiful! And, isn’t it great when everything comes together “just-so” for that perfect knitting experience? Well done. It’s gorgeous and I’m sure your mom will love it. It’s absolutely perfect, and I can’t believe how quickly you knit it up! I think it’s a perfect size. It is exquisite! Enjoy showing it off. You did such a fabulous job knitting all that lace! I’m so happy for you that you’ve completed your first shawl! So exciting! And! I’m so glad everything turned out just as you hoped, and hopefully, just what your mother wants. I think your mom will LOVE this no matter what size you made it! It came out beautiful. Good job! Gorgeous. Your mom will love it. Wow.. I really am impressed.. you did a great job.. and I’ll forever marvel at how lace blocks out.. it’s like magic! I hope your mom likes it the way it is… the best part? It doesn’t look retarded! lol! Beautiful! I’m sure your grandmother will want one after she sees this! Ooops … late to the party! Displaying a blocked shawl is always such a spectacular sight! Lovley pattern indeed! It is a wonder how much differenct blocking can bring to the garment … especially a shawl … the true beauty is just hidden if not blocked. I’m positive your mom will be happy with it. It’s gorgeous. Or if not, give it to your grandmom and make your mom a smaller one. Beautiful shawl, I’m sure your mom will love it. I am amazed at how fast you completed this project. 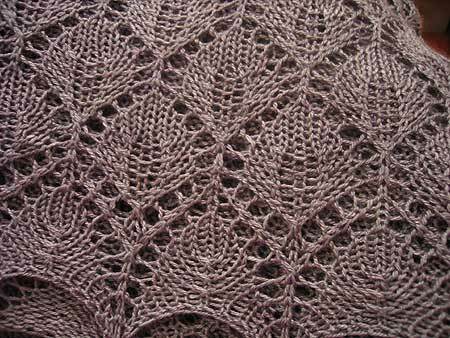 Do you know if there are patterns for knitting lace tablecloths? I love knitting lace, but a person can only have so many scarves and shawls. Lovely job, Kathy! But I’ve yet to see anything you do be un-lovely. You did the yarn and the color justice with your knitting and blocking. Your mom is gonna love it. And the nice thing about shawls is that you can sorta fold over the top long edge as much or as little as you want so that the shawl is a big or as little as you need, at the moment. I think your mom will love the size of it as soon as she sees it. You must report back her response, with perhaps a photo or two! Just too beautiful. I even blogged about you on my blog. you’re such a super fast knitter!!! What a gorgeous shawl. I am always awed by your lovely projects and your speedy completion of them. And, I can’t wait to get the goods on this magical mysterious dyer. That yarn looks like heaven. Absolutely GORGEOUS!! I have this pattern, and the yarn, now you’ve inspired me to get cracking. And yes, I would LOVE to have my Jaywalkers and blog link in your gallery. This pattern is awesome!! Grumperina, you are such a stimulating, prolific knitter! 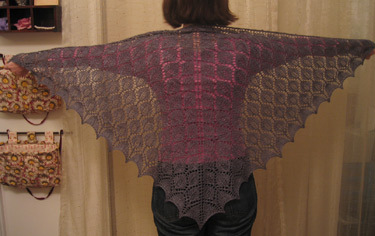 I am flabbergasted (and quite envious)that you knit a lace shawl in four days. The shawl is very beautiful, as is the dye-job. If your mother believes the shawl too long, she could always fold back 2-4″ of fabric for a “collar” of lace, like many “Wedding Ring” shawls of the Shetland isles. The pattern looks amazing in Vesper sock yarn. Late to the party, as usual, but this is absolutely gorgeous. I hope you’ve made peace with lace – I can’t wait to see what else you do. I’ve loved reading about the progress of this project. The thinking behind choice of pattern and yarn, and photos of the finished item are a real inspiration to all aspiring lace knitters. I’m sure your mother will love it. Ooh ooh ooh la la…that is absolutely beautiful! Great job! It’s stunning. It’s absolutely gorgous! Congratulations on a job well done. Your mother will love it! I do so look forward to knowing the dyer’s name and contact info. I’m looking for a bit of custom work my own self. Feeble, pah! Everyone can see that its gorgeous. And it knit up so quickly! I don’t think your mom will mind the largeness of it one bit. That is a bit of work and love that will be treasured, I’m sure. That’s truly beautiful. I think your mom will love it regardless of the size. The shawl is gorgeous!!! And the colour too! Your mother will be happy with it!! The shawl is beautiful and your work very inspiring! On the first photo for the entry, you have some very nice hanging things (sorry–not sure, but they look like some kind of tapestry wall hanging/storage things)….are they storage? They are so cool! Where’d you get em :)? its lovely, iam so sorry because i cant buy the pattern, they dont sell to sweden, what can i do for gett the pattern? ?